Residential Rubbish Removal | 1800-GOT-JUNK? We can take just about anything, as long as it’s non-hazardous and can be lifted by our two strong crew members. 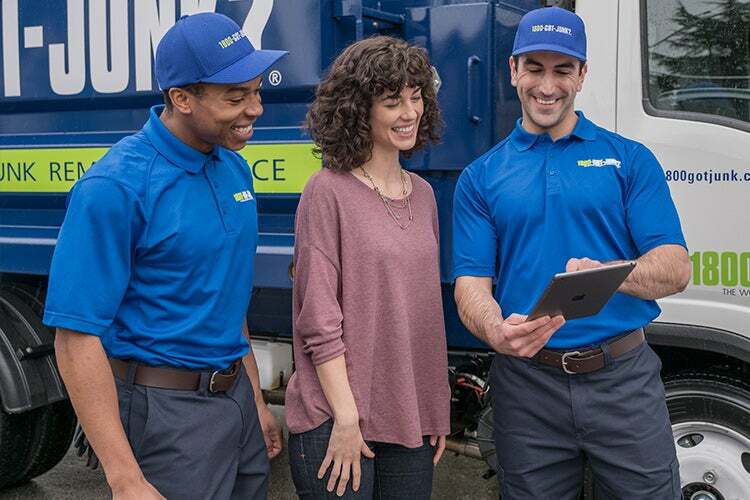 Our team is happy to meet all of your junk removing needs! To get started, book your no-obligation appointment online or by calling us at 1800-468-586. We can often be there on the same day! Our friendly, uniformed truck team will call you 15-30 minutes before your scheduled 2 hour arrival window. When we arrive, just point to the junk you want removed and we will provide you with an upfront, all-inclusive price. Once you say the word, we’ll haul everything away from wherever the items are located. We’ll even sweep up the area when we’re done! Plus, we recycle and donate your junk whenever possible, so you’re helping to keep junk out of the landfill and giving back to the community, too. Learn more about What We Do and the 1800-GOT-JUNK? Environmental Vision .